The federal government recently required states to change the way they issue endorsements for Commercial Driver License (CDL) holders who transport hazardous materials. The Transportation Security Administration (TSA) will fingerprint and conduct background checks on all CDL holders that are applying for, renewing or transferring a HME. To get a HME, you must complete an application from TSA and submit your fingerprints. To renew your HME, you must be fingerprinted at least 45 days before your license expires. Drivers who do not intend to transport HAZMAT do not need this endorsement. The USA Patriot Act requires background checks for all commercial drivers who apply for, renew or transfer a HME. Drivers who surrender an endorsement will not be subject to a background check. TSA developed this plan to protect against the threat posed by terrorists transporting HAZMAT. TSA will notify New Jersey with the results of the background checks and New Jersey will either issue or deny a HME based on that information. A driver must be a U.S. citizen or lawful permanent resident to hold a HME. 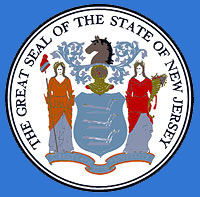 Those receiving a HME in New Jersey must also comply with the MVC's 6 Points of ID requirements. What is considered a HAZMAT? What if I am denied a HME? You may appeal on the grounds of mistaken identity or other information, such as a reversed conviction. Acknowledge conviction or were found not guilty by reason of insanity of a disqualifying criminal offense. Acknowledge being adjudicated mentally incompetent. Were involuntarily committed to a mental institution. TSA must respond to an appeal or waiver application within 30 days of receipt. At the end of that period, if no appeal or waiver is granted, TSA will contact you and notify the State that you remain disqualified. If a waiver is granted, TSA will contact you and notify the State that the endorsement will be issued. How long is my HME valid? In New Jersey, the endorsement is valid for four years. What are the costs associated with obtaining a background check for HME with TSA? It will cost $86.50 for the entire process. Where can I find more information on endorsements? What are the reasons I will be denied a HME? Distribution of, intent to distribute or importation of a controlled substance. Dishonesty, fraud or misrepresentation, including identity fraud (felony-level embezzlement, tax evasion, perjury and false statements to the federal government). Possession of a firearm or other weapon. Conspiracy or attempt to commit any of these crimes. Unlawful possession, use, sale, distribution or manufacture of an explosive. A crime involving a severe transportation security incident (involving significant loss of life, environmental damage, transportation system disruption or economic disruption in a particular area). Improper transportation of a hazardous material (minor roadside or placard infractions are not automatic disqualifiers). Conspiracy or attempt to commit any of these offenses. What is the HAZMAT background check? In addition to running your fingerprints through various FBI, Interpol, and terrorist databases to determine if you should be disqualified, various mental health and immigration checks are also performed. How do I submit my fingerprints? You must submit your fingerprints no less than 45 days before your current CDL expiration. Contact TSA’s contracted fingerprint vendor MorphoTrust USA at (855) 347-8371. You will pay your fingerprinting fees directly to MorphoTrust USA. NOTE: Act as early as possible to meet these new guidelines. Although you have been given a 90-day notice, the HME should be completed no less than 45 days from your current expiration.